Dynamic pricing is a revenue management process where the products or services are priced differently depending on the current demand and supply conditions in the market. The benefits offered through dynamic pricing can broadly be divided into three categories; increasing the average price per unit, increasing sales volume and collecting data on buyer behavior. Understanding the fundamentals of dynamic pricing as a revenue management tool is crucial; the role of pricing methods becomes increasingly important as industries become more and more uncertain and competitive. Rapid improvements in gathering real-time business intelligence have made dynamic pricing a popular tool for revenue management. Already commonplace in the travel, leisure and hospitality industries, several new industries such as entertainment and retail have started to leverage dynamic pricing to drive their business over recent years. In order to be successful in the implementation of dynamic pricing, careful planning needs to be made in terms of preparing the organization, setting the targets and choosing right resources. Readiness to mitigate the main authority, communication and technology-related risks enables rapid implementation. This article describes how dynamic pricing can be utilized to improve the top line – from setting up the objectives to execution of revenue management. 1. Customer segmentation: Dynamic pricing allows separate optimization of the prices for early committing consumers, who normally pay a lower price, and last minute purchasers, who pay a premium for convenience. In practice, there is a whole spectrum of consumers with distinct demand curves. 2. 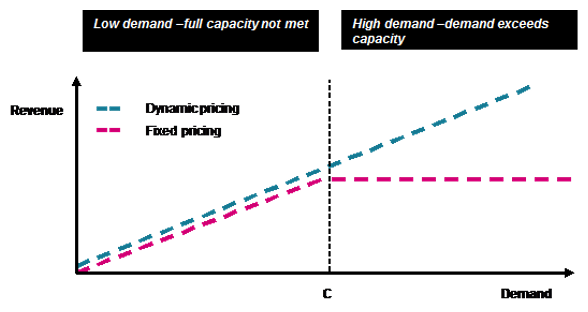 Adaptation to demand: In dynamic pricing, starting prices can be set conservatively to allow optimizing revenue when demand is lower than average. Prices are then raised in response to initial sales, so that higher than expected demand results in increasing revenue. High demand situations provide the opportunity to boost revenues by revising prices upwards, resulting in higher unit prices. Similarly, downward price shifts might prove beneficial in cases where demand has been low, potentially acquiring more customers and avoiding operating at loss. 3. Customer intelligence collection: Dynamic pricing provides a great source of data on buying behavior, allowing companies to map average or even individual demand curves for customers. This can be leveraged in identifying the most price sensitive customers and targeting other offerings of a company to them. Additionally, such data can be utilized in better planning of inventory usage. Figure 1 illustrates the revenue improvement of the first two mechanisms. Suppose that fixed capacity C (such as seats on a flight) of a product must be sold by time T (before departure), after which unsold stock loses all value. Dynamic pricing can improve revenue over fixed pricing through mechanism 1 by segmenting the customers between the early and the later buyers, increasing the price per unit over time in high demand situations. Similarly in an event of lower demand, prices can be set conservatively to push sales volume and ensure profitability (mechanism 2). In our experience of designing and implementing dynamic pricing, we have pursued all of the above targets – customer segmentation, adaptation to demand and customer intelligence collection. Implementing dynamic pricing alongside a new product launch for an entertainment company, we were able to utilize the dynamic pricing process to, not only manage the revenue and profitability, but also obtain valuable data on customer behavior. This allowed further fine-tuning our pricing approach iteratively. Implementing dynamic pricing in a timely manner requires proper planning, the right tools and systematic execution in an iterative way coupled with good risk management. Figure 2 represents this overall process of revenue management implementation. The approach depicts the overall framework which needs tailoring based on unique product and industry specific needs. 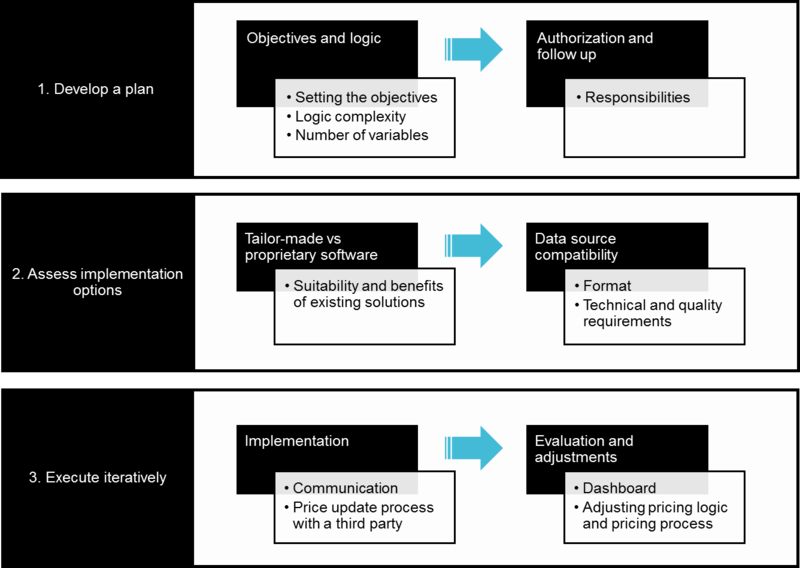 The first step is focused around objective setting: targets need to be clearly defined to allow successful design of pricing tools and processes. The ambition should be derived from strategic goals: do we want to raise the utilization rate to cover fixed costs, reap more revenue by segmenting current clientele or get new consumers attracted to our new offering. Ambition level can be set as a certain average unit price, a volume target, collection of specific customer data, a shift in customer behavior or any combination of the previous. The implementation becomes easier, if there is a clear ambition level defined as the target. The second key step is assessing the implementation options: choosing the right resources to pursue the objectives. Dynamic pricing can be implemented using a variety of tools, ranging from a spreadsheet to proprietary software. A key consideration in choosing the tool is the number of variables used in the pricing logic: A simple dynamic pricing equation with a handful of variables can be set up relatively easily in a spreadsheet, while a pricing equation utilizing tens of variables could benefit from an existing software solution. Also format and source of pricing data need to be considered when making the decision as they may increase the implementation costs of off the shelf software solutions. Equally, even if a pricing model has many inputs, the benefits of a software solution decrease, if the used data is not compatible with the software. Finally, the choice of the tool needs to consider the overall pricing process where the follow-up on revenue and adjustments are key. Most software solutions provide dashboards for revenue tracking for this purpose. The flexibility of the solution to changes should be considered as well; as the process evolves, often times so do the pricing logic and the variables used, so flexibility to do this may be required from the solution. When the pricing model is ready for execution phase, communications become crucial. Responsibilities and timely data inflows/outflows regarding the pricing process must be clearly communicated internally and to third party vendors. The customers need to be approached with a clear message on what the dynamic pricing means from their point of view, such as “buy early and save”. Additionally, the chosen revenue management approach should be constantly evaluated. Setting up a dashboard is oftentimes beneficial to allow real-time checkpoints against reaching the objectives. Leveraging the constant data flow to regularly check whether assumptions of the initial model hold and whether the pricing process needs readjustments. Based on our experience, good planning has been the key for avoiding issues in implementation phase. The potential issues to look out for can be divided into three main categories: authority, communication, and technical. Authority issues can arise as a result of poor planning and lack of alignment with strategic objectives, ambiguous decision making processes or contradicting employee incentives. In our experience, if dynamic pricing is implemented for the first time in an organization, having a single person drive the initiative inside the organization will help with coordinating the key decisions. The lack of clear leadership over the dynamic pricing process can slow down decision-making and ultimately slow down implementation. While this risk is not critical, good forward-looking planning can enable a smoother and quicker adoption. A more complex authority issue can arise from contradicting incentives. While one employee might be compensated on increased average unit price, another might be incentivized to drive volume. If employee incentives are not aligned as part of the implementation process, the result can be a draining internal power struggle. Technical issues are mainly related to choosing the right tool, and need to be mitigated as technology can really make or break a dynamic pricing initiative. Data compatibility represents one of the more obvious issues that dynamic pricing can encounter; but model flexibility is more unpredictable. After a pricing model is rolled out, there are bound to be adjustments and changes made to the parameters or logic of the pricing. Focusing on ensuring the scalability of the pricing model as well as its adaptability to changes can save a lot of time in the later iteration. Based on our experience, good planning was the key in preventing a potentially harmful outcome. In one case, due to unexpected 3rd party technical difficulties, our main pricing tool went down just before launch and was unavailable for two weeks. However, we had proactively prepared a backup tool that was immediately deployable. Mitigating the most crucial technology risks carefully is always the additional resource investment. Finally, communication issues can arise always when a significant change is encountered. With customers, preparing them for the change and communicating about it openly will help alleviate the resistance to change. Emphasizing the benefits of the new system, for example “buy early and save”, will resonate with price-conscious customers. Additionally, if one reason for dynamic pricing is to steer customer behavior, then this should be reflected in communication. In our experience, having the dynamic pricing implementation alongside with the new product launch increased the need to communicate openly and early about dynamic pricing. Especially with the price-sensitive customer segments, the “buy early and save” message was made very clear. Dynamic pricing is a powerful approach to improving profitability and revenue through customer segmentation and adaptation to demand, while providing vital data on customer price behavior. The key to successful implementation is thorough planning, the use of the appropriate tools and good communication to all stakeholders throughout the execution of the plan. Being prepared to mitigate the most common communication, technical and authority-related risks is key to a rapid implementation.